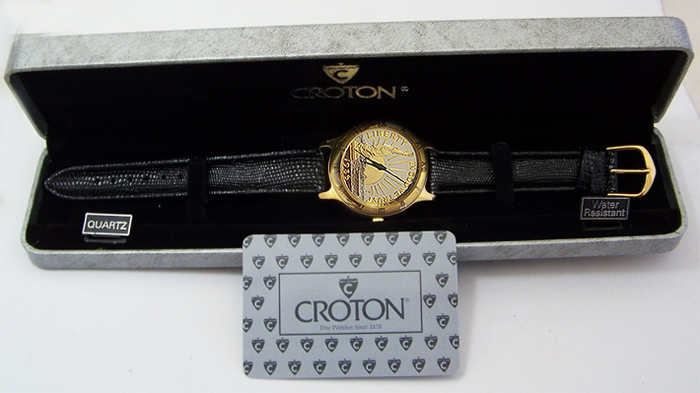 Click the button below to add the Statue of Liberty Watch 23K Gold Plate Coin Croton Lmt Ed Wristwatch to your wish list. Statue of Liberty Watch. Liberty Coin Collectible Wristwatch, New. Sold out numbered limited edition Collectible. New,Unworn, working condition: Two only: listed on multiple sites. It will be pulled from all sites once sold. 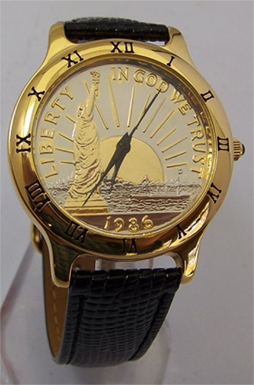 Mens Statue of Liberty coin watch. 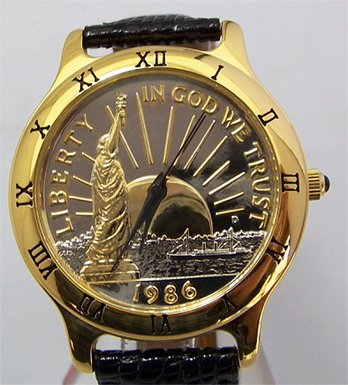 New, unworn working collectible numbered limited edition Liberty 23K gold plate coin wristwatch. Mens 38 mm diameter round watch on 18mm black lizard grain style genuine leather band, Japanese quartz movement, water resistant to 3ATM (30 meters, 99 feet), stainless steel back. 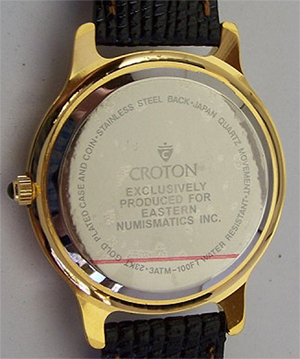 The watch features 23K gold plate 1986 Liberty coin and watch case of Made by Croton, makers of fine timepieces since 1878 released exclusively for Eastern Numismatics in a numbered limited edition. This is a new unworn working collectors timepiece with all papers packaging and padded case.